Meniscus tears are one of the most common knee injuries I see. 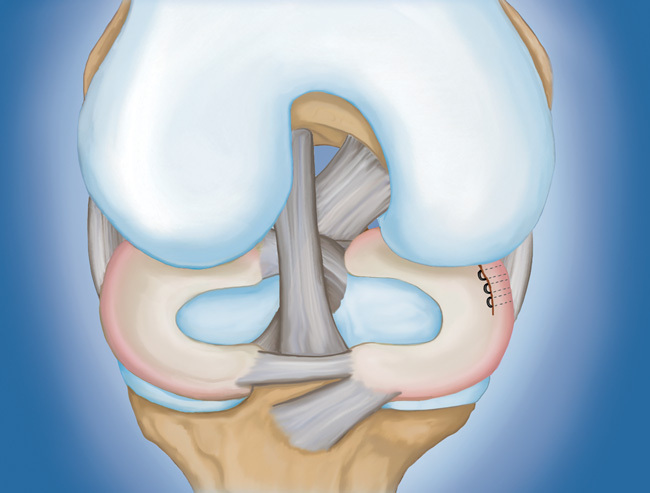 Athletes are at risk for meniscal tears, however anyone at any age can tear a meniscus. When people refer to torn cartilage in the knee, they are usually referring to a torn meniscus. 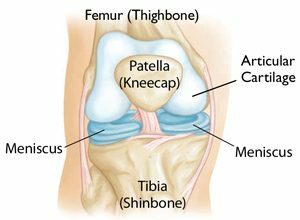 Three bones meet to form your knee joint: the thighbone (femur), shinbone (tibia), and kneecap (patella). Two wedge-shaped pieces of cartilage act as “shock absorbers” between your thighbone and shinbone. These are called meniscus. They are tough and rubbery, similar to the cartilage in your ears and help to cushion the joint and keep it stable. Sports-related meniscus tears often occur along with other knee injuries, such as anterior cruciate ligament (ACL) tears. (Left) Bucket handle tear. (Right) Flap tear. Sudden meniscus tears often occur during sports. Players may squat and twist the knee, causing a tear. Direct contact, like a tackle, is sometimes involved. You might feel a “pop” when you tear a meniscus. Most people can still walk on their injured knee. Many athletes keep playing with a tear. The knee can gradually become more stiff and swollen over the next week. After discussing the history of your injury and your current symptoms, I will examine the injured knee. Tenderness along the joint line and/or special tests that put tension on a torn meniscus may cause a clicking sound and indicate a torn meniscus. Many other knee problems cause similar symptoms. Imaging tests help confirm the appropriate diagnosis. X-rays: Although x-rays do not show meniscus tears, they may show other causes of knee pain, such as osteoarthritis. Magnetic resonance imaging (MRI): This study can create better images of the soft tissues of your knee joint, like a meniscus. How I treat a meniscus tear depends on the type of tear, its size, and location. The outside one-third of the meniscus has a rich blood supply and may heal on its own, or can often be repaired with surgery. The inner two-thirds of the meniscus lack a blood supply. Without nutrients from blood, tears in this region cannot heal. These complex tears are often in thin, worn cartilage. Because the pieces cannot grow back together, tears in this zone are usually surgically trimmed. Treatment plans are customized to each patient to allow a return to activity. Type of tear, age, activity level and related injuries all play a factor in determining your treatment. 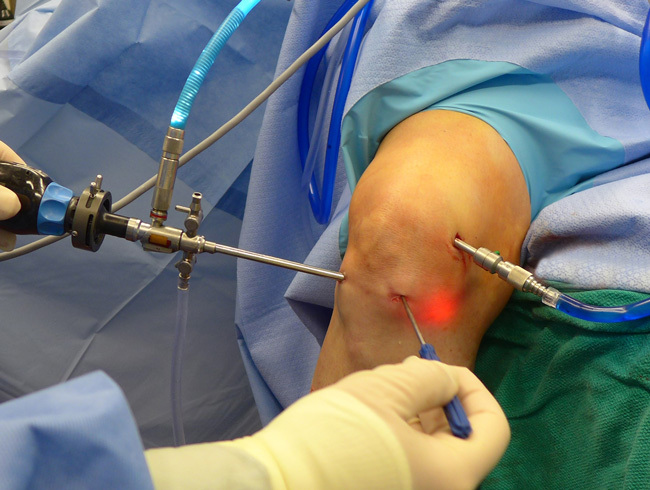 Knee arthroscopy is one of the most common surgical procedures I perform. It is a minimally invasive surgery in which a camera is inserted through a small incision (portal). This provides me a clear view of the inside of the knee. 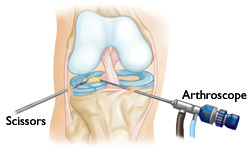 Small instruments are placed through other portals in the knee to trim or repair the meniscus. 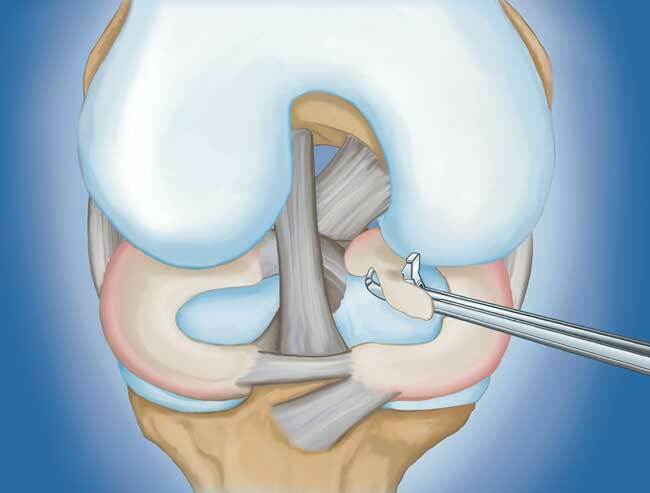 Meniscus repair.Some meniscus tears can be repaired by suturing or stitching the torn pieces together. This depends upon the type of tear, the location, as well as the overall condition of the meniscus. Because the meniscus must heal back together, recovery time for a repair is much longer than from a meniscectomy. Rehabilitation. After surgery you may require crutches and/or a brace. This will be determined by the type of surgery I had to perform. Once the initial healing is complete, you may require therapy to restore motion and strength in your knee. This will allow you to effectively return back to your activities. SOURCE: Department of Research & Scientific Affairs, American Academy of Orthopaedic Surgeons. Rosemont, IL: AAOS; February 2014. Based on data from the National Ambulatory Medical Care Survey, 2010; Centers for Disease Control and Prevention.